Most drummers these days start by playing rock and metal on the drums. The popular style of music these days tends to be rock, and for this, most musicians stick to this only. Playing rock and metal drums is not a bad thing at all; in fact, every drummer should learn this unique style of drumming at some point in their life. However, there is a lot more to drumming and music than just rock. As drummers, we are supposed to be able to play all styles of music, jazz and Latin included. There are so many benefits to learning these styles I cannot explain them all in one article! Jazz and Latin drumming is a totally different style and feel than rock; one that when mastered, it will boost your skill as a drummer drastically. The main reason why you should take the time to learn Jazz and Latin drumming is the skills you will obtain with these styles. With rock drumming, most beats are played in the common 4/4 time signature with you right hand being dominant. You will accent the 1 and 3 counts of the beat and play as loud as you can crank the guitars. This is totally different with Jazz and Latin. With Jazz, you play in a triplet feel most of the time, accenting the 2’s and 4’s of the count. You play with more subtlety, accenting the other musicians with shots on the drum set played with dynamics. Latin music will use your opposite hand for the dominant one, and force you to play grooves you would never play in a rock group. All of these unique styles and skills required for Latin and Jazz can be used in any style of music. Transferring your skills of Jazz and Latin over to rock has been done with every professional drummer out there. If you look at the history or any major professional drummer, you will see Jazz and Latin drumming as their main styles of drumming. Mike Portnoy, Neil Peart, Joey Jordison, Thomas Lang, and Steve Smith are just a few that have studied jazz and Latin drumming before entering the rock scene. Having these styles behind them allow them to be able to play much faster, with more creativity and control. Every drummer should at least tackle the basics of jazz and Latin for this reason alone! The second reason why Jazz and Latin drumming are essential to learn is for your career sake as a drummer. The more styles of music you know the more valuable of a musician you become. If you are looking for work and only have rock drumming on your resume, you will not be accepted that easy; any drummer can play rock. However, if you are able to play even the basics of Jazz, and Latin, you will be much more valuable. For this, you will get more work playing. The more experience a drummer can get the better he will be on the whole. Taking the time to learn a new style of music can be hard to do. Most people do not have a lot of time for practice as it is, so trying out a new style may be stressful. However, think of it like this: practicing Jazz and Latin on the drums will increase your rock drumming twofold. It is totally worth the time and energy to learn these incredible genres of music. Take some time to look at these few lessons on the following to help get you started! Double Stroke Roll - Another very essential rudiment. The double stroke roll is a little more tricky to master than the single stroke. This is something every drummer must master, as it wil build key muscles for independence. Jazz Drumming System - Want to learn Jazz with detailed video training? 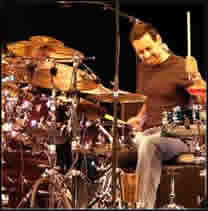 Check out Mike Michalkow's complete Jazz Drumming System. It includes 3 DVDs, an audio CD, and a professionally printed workbook to guide you every step of the way. How To Play Latin Drums - Read more about playing Latin on the howtoplaydrums.com website. There are some helpful tips that you will definately want to read. Latin Drumming System - Get detailed video training for Latin drumming with Mike Michalkow's unique DVD training. The Latin Drumming System will boost your learning dramatically! How To Play Jazz - Learn more about Jazz drumming with this article. A great read.